Back in June, there was a Kickstarter campaign to support the creation of a digital edition of the Cerebus comic book series by Dave Sim. 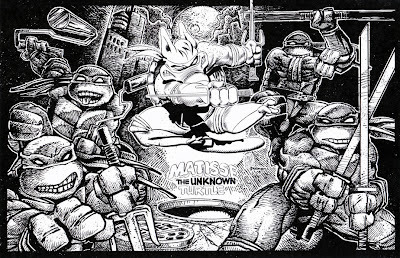 One of the rewards that was available was an art print of a jam piece between Kevin Eastman and Sim. 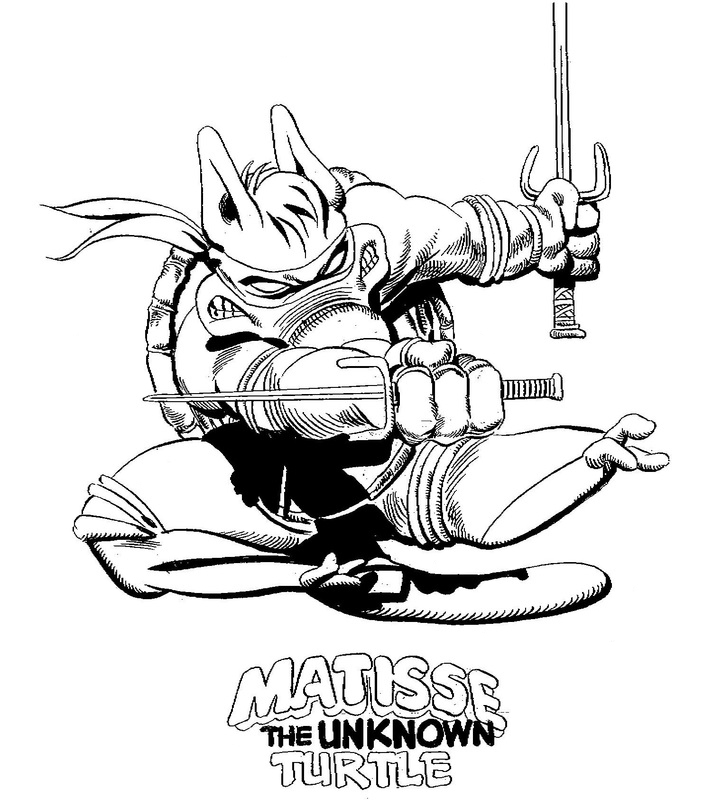 Sim started the piece, portraying Cerebus as "Matisse, the Unknown Turtle." 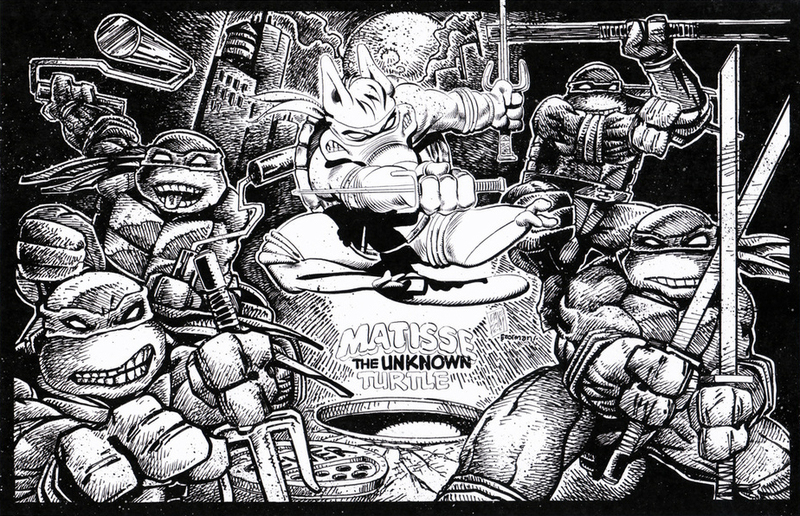 He then sent it off to Eastman to finish it. Just yesterday, the final piece was revealed as the one pictured above, and as you can see it's AMAZING! About a month ago, Dave Sim (with a little help) launched a Kickstarter campaign to support efforts to digitize his Cerebus comic book. The original plan was to just raise enough to do the "High Society" story, but as support for the project has grown, Sim is now dedicated to releasing all 300 issues in an ultra-high quality digital format. As is the case with all Kickstarter campaign, there are rewards offered for different support levels. 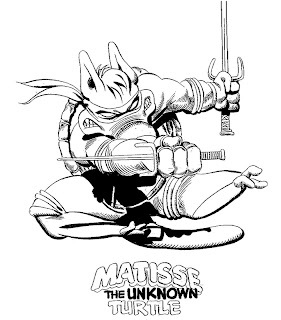 For one of these rewards, Sim is teaming up with Kevin Eastman to create an exclusive art print featuring the TMNT and Cerebus as "Matisse, the Unknown Turtle." Matisse is shown above; Kevin is still working on finishing the rest of the piece. This print will be sent to all backers who pledge $50 or more. There is a specific $50 level that specifies this print, but anyone who commits to any reward priced at $50 or higher will also get the print. There is just over 1 day left to support this campaign! Don't delay and don't miss this chance to own a print of what is sure to be an amazing and unique piece of art! 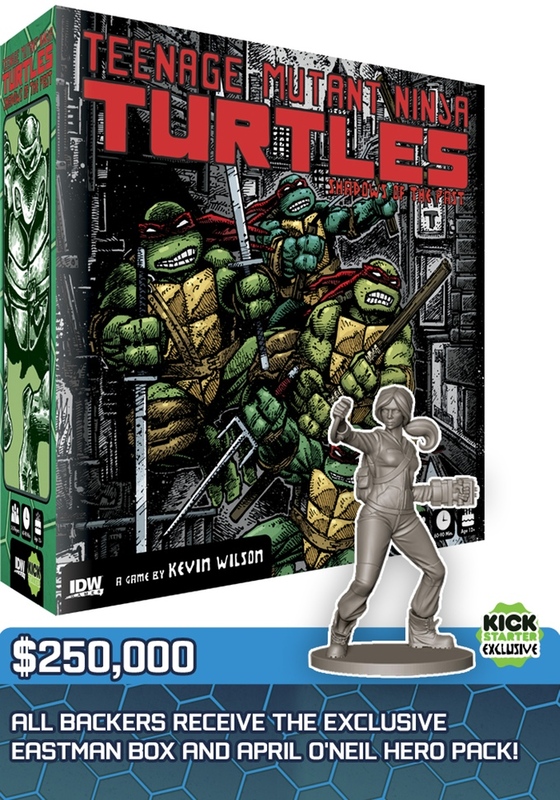 Visit the Kickstarter page and pledge now! 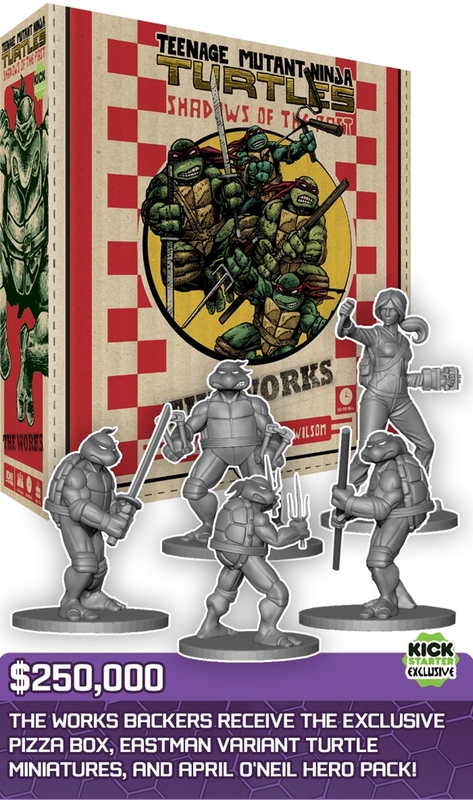 Two names that should be quite famous to TMNT fans are teaming up to create a brand new martial arts comic book titled Sonny Dragon and the Wuxia Knights! Ernie Reyes Jr., creator and co-writer of Wuxia Knights, was Donatello's stunt double in the first TMNT movie, and Keno the pizza delivery boy in The Secret of the Ooze. 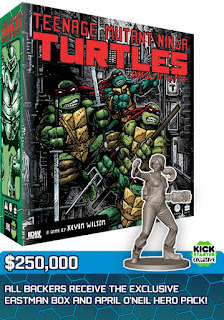 Jim Lawson, artist on Wuxia Knights, has drawn more TMNT comic books than anyone else in the world. 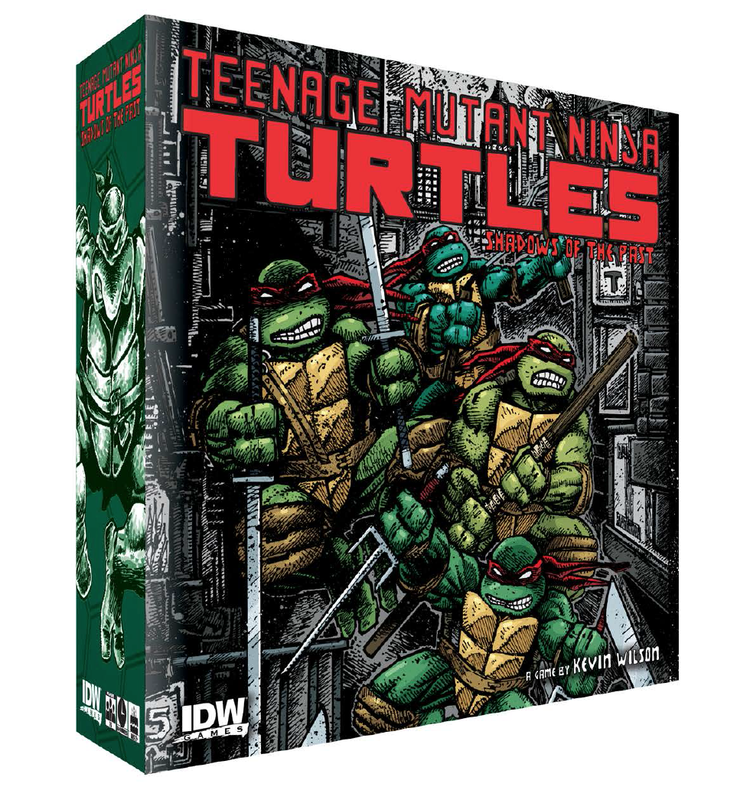 Rounding off the creative team are co-writer Samuel R. Barrera, Steve Oliff on colors, and Tom Orzechowski on letters. 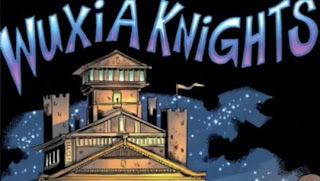 Ernie has just launched a Kickstarter campaign to support the Wuxia Knights comic book effort! Check out a video below to get a sneak preview of Wuxia Knights. And I highly recommend that you support the book on the Kickstarter page! A selection of awesome awards are available at many different support levels! Let's all spread the word and help the team reach its goal! Sonny Dragon and The Wuxia Knights is an ALL-AGES comic, which tells the story of Detective Sonny Dragon joining an elite team of martial arts superheroes known as the Wuxia Knights, after he traces the death of his master to a mystical martial arts kingdom hidden in the streets of San Francisco known as the Wuxiaverse. I have assembled an oustanding team for this new project. 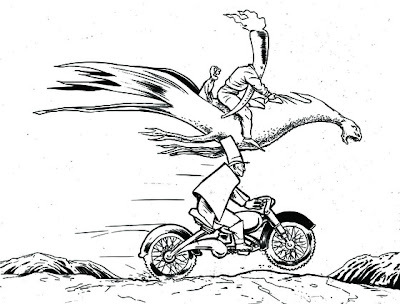 The comicbook script for Sonny Dragon and The Wuxia Knights VOL.1 is written by myself and Samuel R. Barrera. 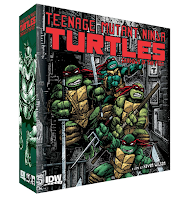 The artwork is done by Jim Lawson, who is known for his work on the "Teenage Mutatnt Ninja Turtles" comics. Colorist Steve Oliff is an Eisner award winning colorist best known for his work on the Japanese manga "AKIRA." Letterer Tom Orzechowski is a Harvey award winner known his work on "Uncanny X-Men." 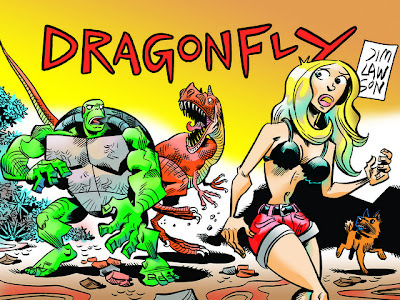 The ALL-AGES comic featuring Sonny Dragon and The Wuxia Knights is created to be a launchpad for licensing across multiple platforms: cartoons, toys, games, and apparel. Funding for this project will help with printing costs, budget for hiring a full service marketing company, and the production of Vol.2. If the goal is not reached before the end of the 30 days, then you will not be charged anything. You only pay if the project reaches its goal before the deadline! My goal is to distribute 25,000 copies of Vol. #1 in 12 months of distribution via digital downloads and conventional print publishing. My plan is to launch martial arts superheroes Sonny Dragon and The Wuxia Knights on July 11th, 2012 at Comic-Con International in San Diego, CA. My mission is to introduce to the world a universe of new martial arts superheroes that inspires health, happiness, and well being while promoting the core values of martial arts: Honor, Loyalty, Family, Bravery.